Before I started using, “Thai,” shin guards I used cheap Title MMA shin guards. Now those worked just fine, barely had to fix them and protected pretty well. One day I landed a hard kick at a strange angle and i felt the muscles in my leg attempt to just rip off the bone. That’s where the Fairtex Twister shin guards came in. The smooth look of them with the detachable foot, unique but simple, eye catching but not flashy, beautiful, something I just truly had to try out. As I mentioned these were a big step up from my first two pairs. For starters they are meant for Muay Thai and not so much for MMA which means they cover more of the shin, some of the knee, and also are more heavily padded. The padding is firm, not solid as steel but firm in order for the shin to not go right through. I’ve used these for sparring and they felt better to kick with and also better to be kicked by. The extra padding does help soften the blow from both sides. Obviously a kick from these is still a kick and can easily cause some pain. Truly remarkable how safe you feel when wearing these though. Nothing I’ve thrown has managed to hurt. I’ve never had any bruising or extreme soreness after sparring in these even if I landed on bone. Not only does the padding do an amazing job but the shin guard itself truly protects almost your entire lower leg. Even the foot is heavily padded which is another amazing quality that these shin guards offer. The foot has a thick padded section which reduces the chance of walking out with a swollen foot after landing on a knee or elbow. Hands down the most comfortable shin guards that I own. Even the foot section and the liner feel comfortable, two parts that usually annoy me. The foot itself wraps around your foot due to its dome like shape which is excellent instead of having some small sectioned rectangle of foam, dangling over your foot like other shin guards. The foot section also protects the ankle and has a small elastic piece that goes behind the heel. It’s very easy to slip through and once your foot sits right, the foot section feels great. It’s also very simple to take the foot off and on considering it’s being held onto the shin by a small velcro strap. Another pro to this is that due to the size and thickness of that small strap you still retain the same flexibility as if you were going barefoot. Even the straps that go behind your calf feel great because the actual section that sits on your calf is padded with some soft foam. Now don’t get me wrong, this is still a velcro strap around your calf that you have to tighten up so during movement you will feel pressure but nothing insane. This is also something not worth fussing over because the straps are needed to hold the shin guard in place, it’s just something worth mentioning. The shin section itself, no complaints yet again. Overall very comfortable and it covers the entire shin with a little bit of the knee. It feels like it completely engulfs your shin which further adds to that secure feeling. Keep in mind I’m 5’5 and these are a large though. During sparring these things rarely ever shift around as long as they’re tightened correctly. I’ve even done MMA in them and yet again no shifting. The bulkiness also doesn’t get in the way and due to the special function of these guards I can always take off the foot in order to slip my feet out easier during grappling. These are definitely meant for Thai but I’ve easily used them for MMA multiple times and never once felt at a disadvantage or uncomfortable. 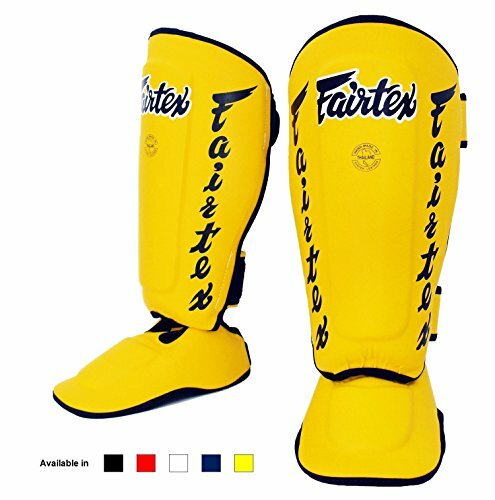 Considering that Twister shin guards are made by Fairtex it’s very easy to assume that they’re a quality pair of shin guards. Of course, that’s exactly what they are. Very well made gear, great padding, very comfortable. One thing to note is that at a quick glance you’d think these were 100% leather but you’d be wrong. Even though the material looks and almost feels like a nice leather, it is in fact synthetic. Something that Fairtex calls, “Syntek Leather.” So far this might be my favorite of any of my synthetic gear, maybe even beating out Winnings Synthetic. The durability of these things is amazing too. Bag work, grappling, MMA, Thai Boxing, I’ve put these things through any test I could think of and they’ve held up very well. The padding, looks, construction, everything looks and feels almost as good as day one. 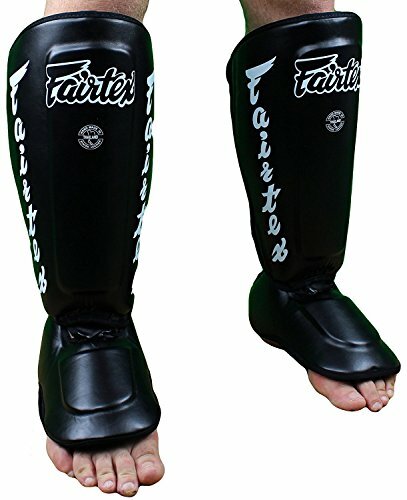 Definitely my favorite piece of gear from Fairtex. As I first mentioned the design sold me on these. The looks, any color they offer looks absolutely sleek and attractive. I’m all about the dark gear but man getting a yellow or white pair is definitely something that’s crossed my mind multiple times. Not only that but the unique feature of the detachable foot is genius in my opinion. It offers a less bulkier option for those that prefer less gear or it offers more protection for those that want or need it. 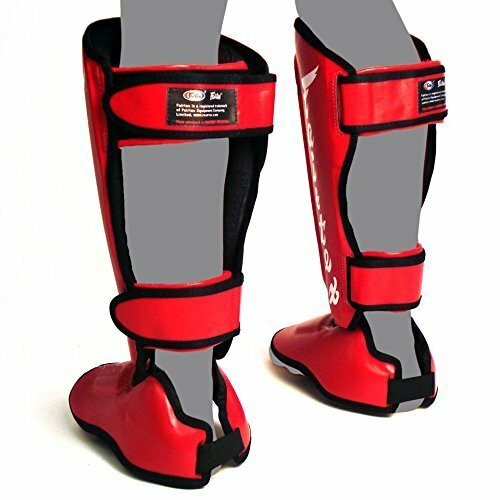 Great option and it’s something I think every shin guard should offer. As I mentioned the foot still has almost full range of motion with the foot section on, it doesn’t get in the way at all. During grappling it is a little harder to slip out of certain things but I haven’t exactly felt the need to take it off because I was at a, “disadvantage.” Again though, the option was there for me. A further plus to this feature is the fact that it actually sits on your foot and stays there. With some other shin guards I’ve used I have to constantly fix them because the foot twisted at a weird angle after a kick. Not with these though, the dome shape helps them to stay in place. The padding, excellent, absolutely perfect in my opinion. When you feel like you could kick steel and walk away without a scratch, that’s when you know you’re wearing something truly protective. I’ve never feared landing a kick and it hurting for whatever reason, never whatsoever. Like I mentioned before I’ve hurt my shin terrible before using other shin guards but not these. The weight of these is around 15oz with the left weighing 15.4oz, 11.9oz without the foot and 3.4oz for just the foot. The right complete shin guard weighs in at 15.2oz, 11.6oz for just the shin, and 3.5oz for the foot. Great weight in my opinion because you don’t feel it during sparring. The Syntek Leather also helps keep the weight down which is just yet again another great design choice by Fairtex. To further lower the weight, the detachable foot can also drop a good 3oz. There is also the small things that make the design just that much better. The white graphics on black Syntek Leather, the small elastic on the foot, or even the small pad of padding on the velcro straps. Absolutely amazing design, hands down my favorite. Depending on where you get these from, the Twister Shin Guards usually go for something around $70. For that price I say get yourself two that way you have an extra color option. Seriously an amazing piece of gear for such a low price. These things are well worth the money and a necessary investment if you plan on sparring. 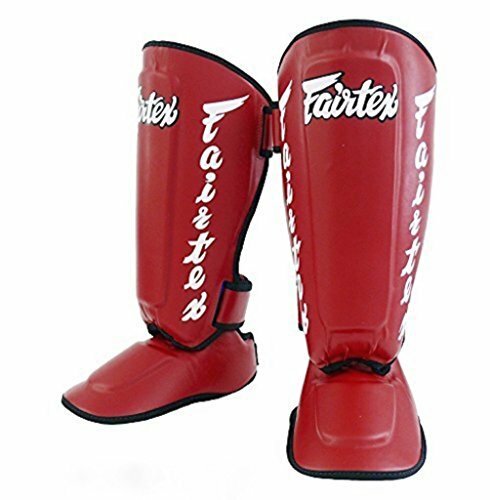 For such a low price you can't go wrong picking up the Fairtex Twister Shin Guards. Nothing has protected my shins as well as these and my only regret is not getting them earlier. 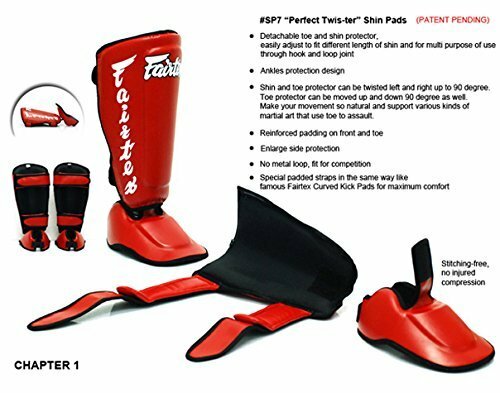 Lobo purchased this pair of Fairtex SP7 Twister Shin Guards himself for the full price. This did not influence the outcome of this review.